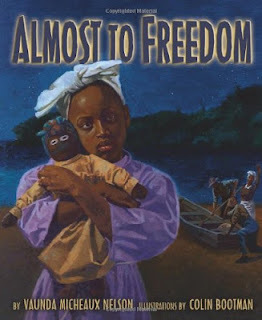 A few days later, I walked into a bookstore (Alamosa Books - an amazing independent bookstore in Albuquerque, with the most friendly and helpful staff), and saw ALMOST TO FREEDOM by Vaunda Micheaux Nelson on display. The gorgeous cover art pulled me in immediately, and when I read the blurb on the cover, I knew this was the book my daughter had been so excited about. I won the Mommy of the Year award when I surprised her with it the next morning, and of course we had to cuddle on the couch immediately to read it together. I have to say, I should have read the book to myself first. I wasn't prepared for the plethora of tears I shed while trying to read this heartbreakingly sweet story! I had to stop several times to dry my eyes and find my voice. What an amazing way to introduce children to this era in American history. This should be a staple in elementary school libraries and home libraries alike!